Something you should know about me: I am a voracious learner. With three pairs of horns in my astrological signs—Taurus, Aries, Capricorn—when I decide I want to learn something, I am relentless in my research. It really doesn’t matter what it is, from cryptocurrencies to a language to the origin of the word foobar, I won’t stop until I feel like I can have a relatively intelligent conversation about the topic. When I first heard about Stefano Mancuso from the University of Florence and Plant Neurobiology, I had to know everything. I started with the watered down articles found in most online news publications, and gradually worked my way through video presentations and all the way to technical papers. I did not have much experience with the scientific and technical jargon you find in academia, but that was not going to stop me. With the help of a few good dictionaries—because for this type of language, one is never enough—I launched myself on a quest to understand all I could about plant behavior and signaling. Not everyone is favorable to the idea that plants are intelligent and capable of complex decision making. If you think about it, accepting that plants are intelligent and rational beings would mean that we have to rethink our entire relationship with the plant world, from food to landscaping. Take a minute to contemplate that. You think animal rights is a difficult issue, what happens when you start to understand that the tulips you cut from the ground and put in a vase are alive, as is the salad on your plate. Oh, and if boiling live lobster for a fancy meal is a problem because they scream, what if I tell you that the roots of the veggies in your favorite stir-fry also emit a sound that communicates to others?! Don’t panic… it is not as bad as you think. Plants are not humans nor animals, so their systems are completely different, which requires a completely new way of thinking. But this is exactly why it creates so much controversy. It is easy when we think that intelligence is marked by a brain, but researchers like Mancuso and M. Galiano are showing that this is not necessarily true. On the contrary, it could be that this brain-thing we humans have is our biggest weakness, since as we are seeing in movements such as blockchain, holocracy and no-management, decentralized is can be more efficient than centralized. More than 10 years later, thanks to the tireless work of Professor Mancuso and other prolific researchers such as Monica Gagliano, Elisa Masi, Elisa Azzarello, Werther Guidi Nissim, and co., the term plant neurobiology has become much less taboo and the idea that plants are capable of making decisions is starting to take form. In addition to the main LINV on the outskirts of Florence, there is a second laboratory in Japan. Research carried out at these labs has lead to collaborations with the European Space Agency to learn how plants grow in space, the Center of Micro-BioRobotics to develop Plantoids for the exploration of new planets, various government agencies on bioremediation with environmental biotechnology in polluted landscapes, and a number of biomimicry and bioutlization projects. 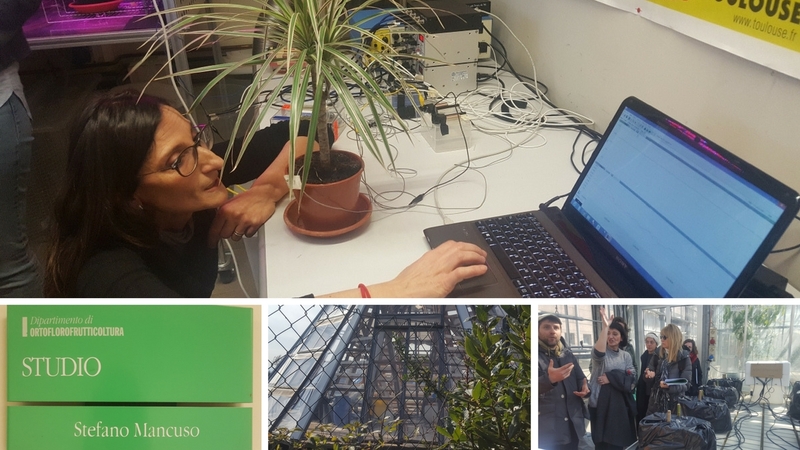 And this year, Mancuso and Leonardo Chiesi, a sociologist and environmental designer from the school of architecture at the University of Florence and UC Berkey, kicked off Futuro Vegetale, a masters degree focused on plants and social innovation. This is how I found myself standing in the LINV. It was hard to contain my squeals of excitement seeing the Jellyfish Barge live, measuring the action potential response of a plant, and discussing the ethics around using plants to sequester heavy metals and then destroying them. As I plan my projects for this year, I am incredibly grateful for the opportunity to lend my own research and ideas to the growing database of plant neurobiology. While plant signaling, plant behavior, plant communication, and even plant consciousness are all part of this discipline, we should not be afraid of a term just because it challenges our way of thinking. Evolution pushes us outside of our comfort zone—you are not going to discover something new doing what you have always done. And given the direction our planet is taking, our very survival relies on learning what makes plants—these amazing beings without conventional brains—more capable of adapting to environmental and social changes than humans and animals. Who better than one of the few beings to have survived every major extinction to teach us how to transform what seems like impending doom (cue Gir doom song from Invader Zim) to an opportunity to take a leap on the evolutionary ladder?! Thanks to your generous support, we have raised 1111€ of our 1300€ goal. We have 6 days left to raise the remaining 189€. Will you help us reach our goal?! Like and Comment on social media to increase reach! If you have any questions about this study or our research in general, you can contact me via my website, Facebook page, and if you are interested in this type of research, our Facebook group on the Effects of Plant Music on Human Health and Interspecies Music. Feel free to share freely. All proceed go to this and future plant music research. Hi I appreciate very much your work. Greetings Mathias! Wonderful goal, would be happy to assist any way I can. Have you had a chance to look at the Music of the Plants device? 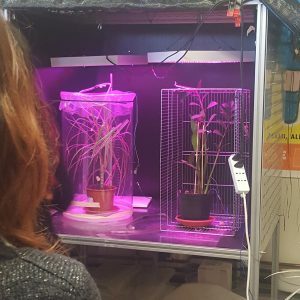 In addition to the device itself, it has a MIDI out that can be used in a variety of ways to create more interspecies interactions between humans and plants. Take a look at the new version here. If you like, let’s move this conversation over to email and talk about your project. I am sure we will come up with something wonderful!